The Mactaquac Dam in New Brunswick, Canada, was opened in the year 1968. Initially it was anticipated to survive for 100 years. However, this timeline was considerably reduced due to a chemical reaction that took place inside the concrete used to build the dam. 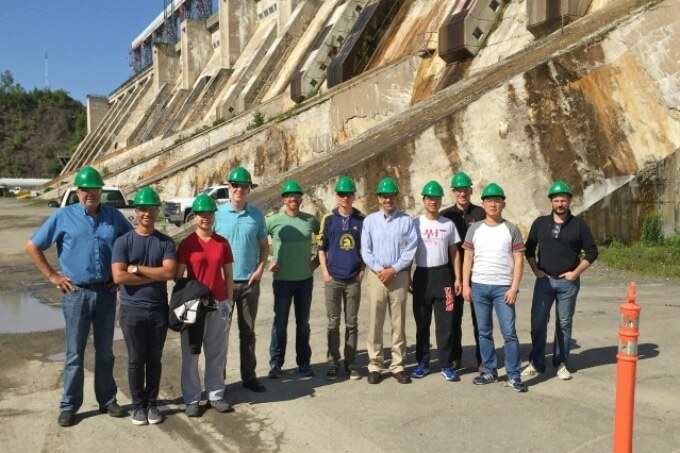 Researchers from the MIT Concrete Sustainability Hub, the University of New Brunswick, and Oregon State University visited the Mactaquac Dam in New Brunswick, Canada, in August. CREDIT: Jeremy Gregory/MIT Concrete Sustainability Hub. Concrete is a mix of cement, crushed rock, sand, and water. Alkali-silica reaction, the cause of the major issues in New Brunswick, occurs when alkalis in the cement pore solution encounter reactive forms of silica in the rock used to make the concrete. The reaction produces a gel which expands as it absorbs water and exerts pressure that can cause cracking and result in structural problems in concrete infrastructure. Jeremy Gregory, executive director of the MIT Concrete Sustainability Hub (CSHub). Scientists at the CSHub, the University of New Brunswick (UNB), as well as Oregon State University (OSU) have collaborated on a study to rectify various concrete durability problems, such as alkali-silica reaction (ASR). While UNB scientists have been performing ASR experiments, scientists at OSU are carrying out research on yet other durability problem termed freeze-thaw. Majority of the computational work related to the study has been performed at MIT, also including specific experimental measurements. Our research collaboration looks at understanding ASR from fundamental building blocks. Starting from an atomistic description, we wish to understand the mechanisms leading to the expansion of the bulk concrete composite. Is the gel expanding? Is the CSH [calcium-silicate-hydrate] expanding? We are looking to answer these questions by understanding the molecular configurations of the materials. Thomas Petersen, research assistant with the CSHub and a graduate student in the MIT Department of Civil and Environmental Engineering. As part of a meeting in August 2017, the researchers paid a visit to Mactaquac. According to Petersen, the visit offered a great chance to find out the prospective effect of the team’s study on infrastructure systems. Laurent Béland, a CSHub postdoc, considers that analyzing the “crazy expansion” at Mactaquac by being physically present as against by observing pictures rendered the at-times-abstract concepts investigated by him to be concrete. Seeing the impacts of ASR on a structure that large, in person, makes you realize how big this problem is; not only is this major dam supplying electricity, it’s making sure a pretty big city won’t be flooded. As an atomistic simulation expert, I’m coming at this from one perspective. Working with people to be able to absorb what this is all about, you see the research impact scaled up. In the past five decades, from the time the Mactaquac Dam was built, it has expanded nearly 9-12 inches in height. Cracking can be observed in the entire structure. However, the problems are not only related to the concrete. There are gates that no longer close—there’s a seven- or eight-inch gap. There are also places where engineers have had to cut through the dam to relieve pressure and, for obvious reasons, you’d prefer that dams not have to be cut into. Although the planners of the cities and the civil engineers who constructed the Mactaquac Dam investigated the aggregate for vulnerability to the alkali-silica reaction, they did not perform the investigations under conditions similar to the conditions at the dam. The industry is till date looking for swift and dependable investigation techniques for ASR that incorporate such factors, the thing that CSHub-UNB-OSU durability research is confident of achieving. The benefit of working on applied topics is that the consequences of diligent and informed engineering practices is vividly portrayed in our everyday life. By advancing our modeling techniques and testing procedures, mistakes in the design of the Mactaquac dam can be avoided in the future. Alice Dufresne, Thibaut Divoux, and Michael Heist—CSHub scientists—recently published research briefs upon the ASR work of the team. The publications are titled “Atomistic Modeling of ASR Gel” and “Mechanical Properties of Alkali Silica gels,” and can be accessed from the CSHub website.